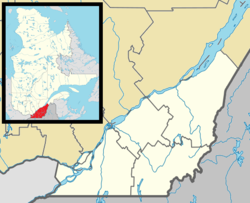 Coteau-du-Lac is a small city in southwestern Quebec, Canada. It is on the north shore of the St. Lawrence River in the Vaudreuil-Soulanges Regional County Municipality. The name of the town comes from the French word Coteau which meant "slope" and from its location on the north shore of Lake Saint Francis. The National Historic Site of Canada of the Coteau-du-Lac canal is the location of the first canal lock system in North America. The city has an industrial park. The population was 6,842 as of the Canada 2011 Census. Lester B. Pearson School Board operates Anglophone schools. ^ a b c "2011 Community Profiles". 2011 Canadian Census. Statistics Canada. July 5, 2013. Retrieved 2014-01-29. ^ "2006 Community Profiles". 2006 Canadian Census. Statistics Canada. March 30, 2011. Retrieved 2013-05-18. ^ Mailhot, Laurent (2000). "Jules Fournier". Dictionary of Canadian Biography.